Jefferson intended to use his concave mirrors, as well as the condensing lenses and scioptric ball he bought in London in 1786, with his microscopes. As he wrote in 1822, "in microscopic observations, the enlargement of the angle of vision may be indulged, because auxiliary light may be concentrated on the object by concave mirrors. "3 The reflecting mirror of a compound microscope would be placed at the focal point of the mirrors. 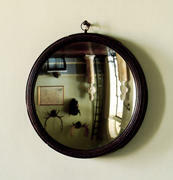 When a viewer stands outside the focal point of a concave mirror, his image is reflected upside down. This optical phenomenon may have accounted for the mirror�s location in the Entrance Hall in an inventory prepared shortly after Jefferson�s death (it currently resides in the Cabinet).4 It might have become a source of family entertainment in Jefferson�s last years, when he had abandoned more complex scientific experiments. Thomas Jefferson to William Jones, 25 October 1806, American Memory Project - The Thomas Jefferson Papers. List of "Mathematical Apparatus," Massachusetts Historical Society. P. & J. Dollond invoice, 3 April 1786, University of Virginia; Thomas Jefferson to Thomas Skidmore, 29 August 1822, American Memory Project - The Thomas Jefferson Papers.